New Roscommon Jersey and Sponsor unveiled. 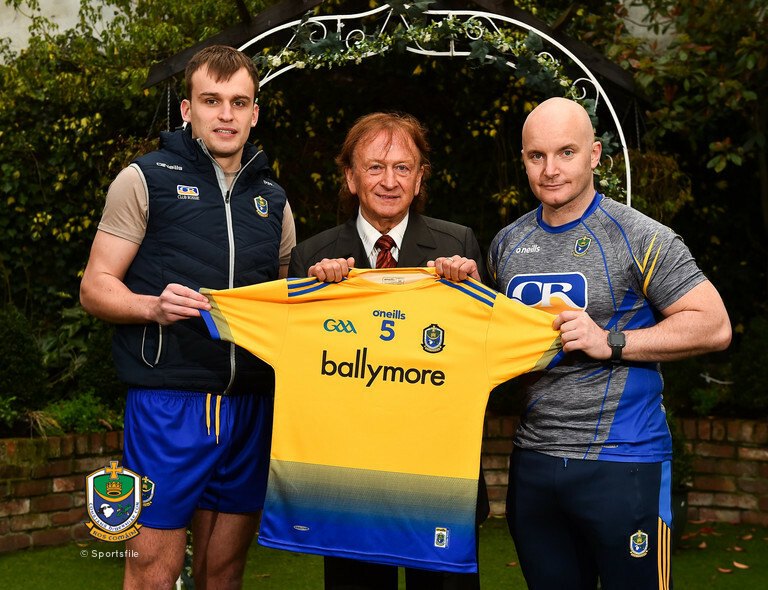 An exciting new Roscommon GAA Jersey was unveiled at a launch in the Glenroyal Hotel in Maynooth today. The Jersey bears the branding of Ballymore who continue as joint main sponsors to Roscommon GAA along with Tom Hunt of Ranger Pipelines for another two years. The jersey manufactured by O’Neill’s will make its intercounty debut tomorrow night in Elvery’s MacHale Park Castlebar when Roscommon face Mayo in the opening round of the Allianz Leagues Division One Competition. In contrast with the previous design, which was inspired by the jersey worn by the greats of the 1980s, the new jersey features a brand-new gradient design, fading towards royal blue at the bottom. Speaking at the launch Sean Mulryan Chairman and group chief executive of Ballymore Group said “I’m delighted to continue my support of Roscommon GAA and the great work they are doing. We in Ballymore are proud to have our name back on the Roscommon jersey and I wish all Roscommon teams all the best in 2019”. “Roscommon is very lucky to have a sponsor like Sean Mulryan. Sean is a Roscommon man who has established one of the biggest property development companies in Ireland and the UK, but has kept a close link with his home place and has always been there to support Roscommon GAA. For many years Sean has been heavily involved in all the good news stories coming from Roscommon GAA. He partnered with Club Rossie when we raffled the house so successfully in our Win a House in Dublin Draw, he’s a supporter of our underage academies, he is backing all the elements of the Gaelic family in Roscommon Football, Hurling, Ladies Football and Camogie. I’d like to thank Sean, his wife Bernardine, all their family for the support over the years and I’d also like to thank Ballymore for all their assistance and expertise over my time as county chairman. Pat Nolan a member of the Roscommon Senior Hurling team said "On behalf of all involved in hurling in Roscommon I too would like to thank Sean and all involved with Ballymore for the continued support that is being given to Roscommon GAA. Like the footballers we too will work hard on the field to match this off-field commitment. Tom Hunt and Sean Mulryan have been joint sponsors of Roscommon GAA for the past number of years. The Club Rossie Logo has adorned the jersey for the past four years to increase brand awareness for this we thank Tom Hunt of Ranger Pipelines for allowing Club Rossie to increase its profile. Ballymore will now appear on the jersey for the next two years for all codes. We are delighted to have this iconic brand name associated with our County Jersey.